This image shows the last 24 hours of waveforms recorded across Switzerland. Unlike the shorted time windows that show data at high sampling rates, only 1 sample per second data is shown here. Only vertical broadband (HHZ) CHNet channels are displayed. On these decimated streams, only the largest local earthquakes that excite longer periods are visible. Teleseismic energy moving across the Swiss network shows up clearly in this view. Stations are sorted in alphabetical order. Waveforms are first deconvolved, then band-passed between 100 s to 4 s. The units are bandpassed ground velocity, mm/s. 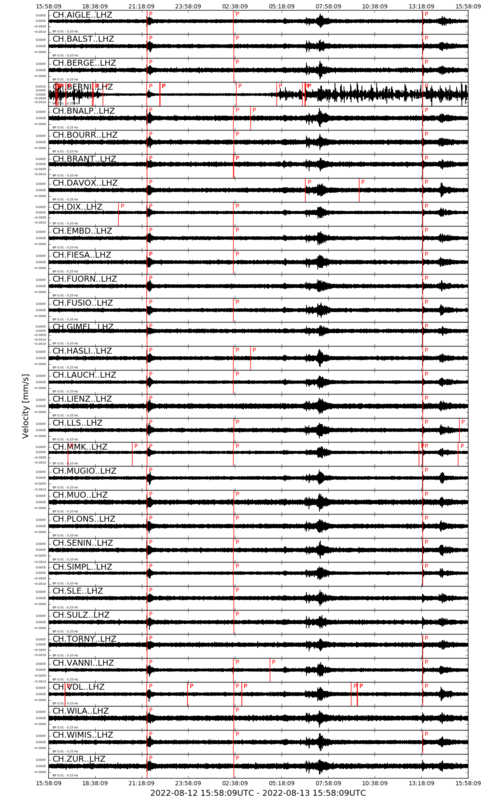 Picks from SED manual relocations (typically only local earthquakes) are in blue or green. The image is updated every 300 s / 5 minutes.